It would be utterly mistaken to imagine that Germany’s political decision to phase out nuclear energy means that it is turning its back on the European concept of modernity in favor of the dark forests, the obscure roots of German intellectual history. This is not simply the latest outburst of Germany’s proverbial love of the irrational, but rather proof of its faith in modernity’s adaptability and creativity in its dealings with risks it has itself generated. In a very short but thoughtful opinion piece, Beck goes on to argue that it is not only the best practical decision, but will also promote the democratic process. By the way, did you know that Whole Earth Catalog editor Stewart Brand supports nuclear power? Addendum: Enjoy Rachel while you can, because this lawyer says that her career is over! Lawrence O’Donnell on the hypocrisy of Joe Walsh. Nation Magazine has a special “sports issue” within which various lefty writers give tribute to their favorite sports heroes – most of them from childhood when we are most influenced by them. Likewise, my favorite sports hero played during my childhood, and I’ll discuss him in a minute. If you were to ask me about my second favorite hero I would be hard-pressed for an answer. Obviously we look for character as well as skill, and perhaps we look to deeds off the playing field/court. Obviously figures which broke the racial barriers qualify such as Joe Louis, Jackie Robinson, Arthur Ashe, and…. well almost, Tiger Woods. We look to Billie Jean King and Shirley Muldowney for examples breaking sexual molds. Or figures like Greg Louganis who won a host of Gold Medals including a performance in which he continued to compete after splitting his head open on the diving platform, and yet was deemed lacking in character and heroism required for the Wheaties recognition because of rumors, later confirmed, of his homosexuality. We have war heroes like Pat Tillman, made even more famous by military controversy rendering him popular even among anti-war activists. I always liked Rams quarterback Pat Hayden who succeeded despite being short (for an NFL quarterback), and while becoming a Rhodes Scholar. There are heroes whose careers suffered at least setbacks due to brave political stands such as Muhammed Ali, Tommie Smith, John Carlos, and even to a lesser degree John McEnroe who turned down a match against Bjorn Borg in South Africa to honor the boycott of the time – the winner would have taken home one million, the loser $750,000 (Borg had accepted the invitation). By the way, if you’re interested, here is a list of sports figures with their campaign donations. Seems like tennis players (except former teen star Andrea Jaeger who is now a nun and gave to the GOP) and basketball players tend to be liberal, while golf players, car racers, and football coaches (except Bear Bryant, who was a liberal?) tend to be conservative. And there are a few on the list who can’t seem to make up their mind on what their politics are, or completely ignore ideology if they like a particular pol. The link for former Bengals quarterback Boomer Essiason is broken, which makes me curious. He was quite a vocal supporter of the NFL strikers despite a number of quarterbacks (who were of course the best paid) crossing the picket line prompting him to call Joe Montana a “scab.” Of interest in the political evolution department, tennis star Pam Shriver appears to have abandoned her conservative roots – donating to Republicans in her youth, but Democrats later in life, including a donation to Maxine Waters! Anyway, enough of that. My favorite sports hero is…. 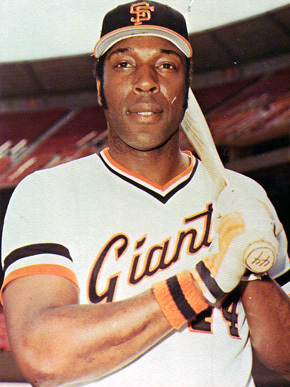 Willie McCovey. He exemplified the rags-to-riches phenomena coming from very humble roots. I was only really into baseball from the second grade to about the fifth, when he was traded from the Giants to the Padres. I went to several games a year at Candlestick, and always looked forward to the number 44 visible from our usual seats behind first base. He was a clutch hitter in so many instances. In his last years Willie Mays batted third before McCovey’s “cleanup,” and if Mays made it to second base McCovey was most often walked. This is a pure sports pic. I mean, other than being a nice guy off the field, his heroism for me is purely on the field and laced with nostalgia. He was there for me at a formative time of childhood. I began to lose interest as a fan when he was traded. I still watched games, but once Bonds, Sr., Tito Fuentes, Juan Marichal, Chris Speier, and McCovey had moved on to other teams or retirement, I stopped going to the green pages every morning to check the stats and standings. McCovery actually came back to the Giants briefl, but as I moved into teen years, I got into other things and didn’t pay as much attention. The Giants always choked anyway. So who was/is your favorite sports hero and why? In terms of percentages of population smoking. New Hampshire smokes more than California! State number one? While there may not be scientific evidence that smoking impairs driving, this article presents anecdotal evidence that it impairs voting. From Heraldo – the following Post Offices in Humboldt County are being considered for closure. When: Saturday, July 30th, 2011 , 8:00 p.m. – Dinner at 6:30 p.m., music at 7:30 p.m. The Tony Award-winning San Francisco Mime Troupe opens its 52nd season with 2012 – THE MUSICAL! ~ along with Cory Censoprano and Siobhan Marie Doherty, who make their San Francisco Mime Troupe debuts in this lively satire about corporate funding and the art of mass distraction. A small political theater company, Theater BAM!, finds itself at a crossroads: should they keep telling the stories they feel can change the world (and starve while telling them), or feed at the corporate trough, sell out, and be the mouthpiece for The Man? Tough decision. So when they are offered a commission from a “green” corporation that could save BAM!, the company is very tempted. All they have to do is create a new show: “2012 – The Musical!” But is it political? Will it keep with the company’s original mission? And who’s really bankrolling the production? For more information call 415-285-1717 or visit www.sfmt.org, or call the Mateel at 923-3368. When a bureaucracy doesn’t like a law, it finds ways to frustrate it. This is a nice piece of amateur investigation. Nothing particularly shocking, but you can tell that the Wisconsin DMV folk don’t like their motor-voter law. And I don’t think there will be any Prop 8 counterpart in that state. California should be ashamed.